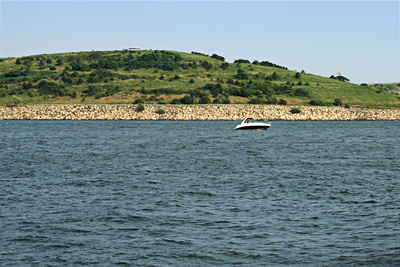 Spectacle Island, 15 minutes by boat from Long Wharf, Boston Harbor. Previously a Boston garbage dump, it has been cleaned up and turned into an eco-friendly park, with snack bar, sandy beach and 5 miles of hiking trails. The North Drumlin of Spectacle Island, with views of Boston.